6 oz. (170.1g) (0.375 pound) resealable pouch. A Box of Twelve 0.65 oz. Resealable Pouches. 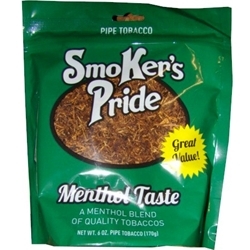 Smoker's Pride Pipe Tobacco is a uniquely balanced tobacco that focuses on flavor and price to deliver a prefect product. Each flavor is rich and affordable with a great balance of aroma and taste. Domestically grown in the USA, Smokers Discounts offers this great brand at a low discount price!